INTERNATIONALLY ACCLAIMED AWARD WINNING SINGER/SONGWRITER/RECORDING ARTIST STEVE FREE WILL OPEN OUR CONCERT SERIES AT 6:00PM ON THE MAIN RIVERFRONT STAGE. THE JOSH STEWART BAND WILL HIT THE MAIN RIVERFRONT STAGE AT 7:30PM. HITS LIKE " KEEP YOUR HANDS TO YOURSELF", "BATTLESHIP CHAINS", "CAN'T STAND THE PAIN" & "HIPPY HIPPY SHAKE" LAUNCHED THE GEORGIA SATELLITES INTO STARDOM. 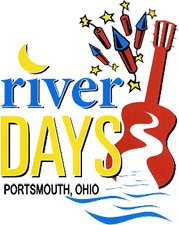 PORTSMOUTH RIVER DAYS IS HAPPY TO HOST THEM AT 9:00PM ON OUR MAIN RIVERFRONT STAGE. COME EARLY AND ENJOY A GREAT EVENING OF MUSIC WHEN KICKSTART TAKES THE STAGE AT 6:00PM. WANT A LITTLE JAZZ ON YOUR FRIDAY NIGHT? A LITTLE CAJUN ROCK? IF YOU DO,THEN HEAD TO THE RIVER FRONT AND LISTEN TO ROBIN LACY & DEZYDECO. THE SHOW STARTS AT 7:30PM FRONT AND COURT ST. THE BOYS ARE BACK! BACK BY POPULAR DEMAND ELECTRIK CIRCUS WILL BE ROCKING THE RIVERFRONT STAGE AT 9:30 WITH ALL YOUR FAVORITE ARENA ROCK HITS OF THE 80'S. FORMED IN 1979 & ROCKED THE 80'S AT VENUES IN OHIO, THIS BAND REUNITED IN 201O, AND WE ARE SO GLAD THEY DID. TEAZER WILL TAKE THE STAGE AT 7:30PM . A GREAT NIGHT OF ROCK CONTINUES. GUESS WHO WILL BE ROCKING THE RIVERFRONT STAGE SATURDAY NIGHT?.....THAT'S RIGHT! WE HAVE THE SPIN DOCTORS! AND WE CAN'T WAIT! THE SPIN DOCTORS WILL PERFORMING AT 9:00PM DON'T MISS IT! PORTSMOUTH RIVER DAYS WILL WELCOME FRANK GRASSO TO THE MAIN RIVERFRONT STAGE AT 6:00PM.. FRANK COMBINES HIS POP, COUNTRY AND ROCK INFLUENCES INTO A SHOW EVERYONE WILL ENJOY. ALWAYS A CROWD FAVORITE, CITY HEAT, WILL HAVE EVERYONE SINGING ALONG AND TAPPING THEIR FEET TO THE CLASSIC ROCK HITS WE ALL LOVE. WE ARE HAPPY TO WELCOME THEM BACK TO OUR STAGE AT 7:30PM. DOC ROC AND THE REMEDIES WILL HELP US CLOSE OUT THE FESTIVAL ON SUNDAY NIGHT. A RIVER DAYS TRADITION, DOC ROC WILL TAKE THE STAGE AT 9:00PM.